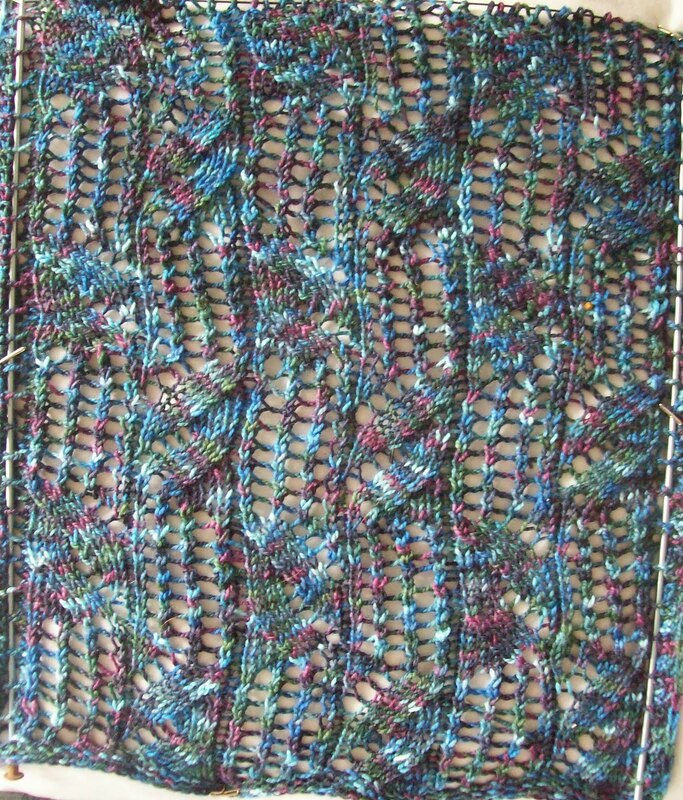 Well for the moment, slow and steady!--I am growing disenchanted with the Leafy Vines scarf already. 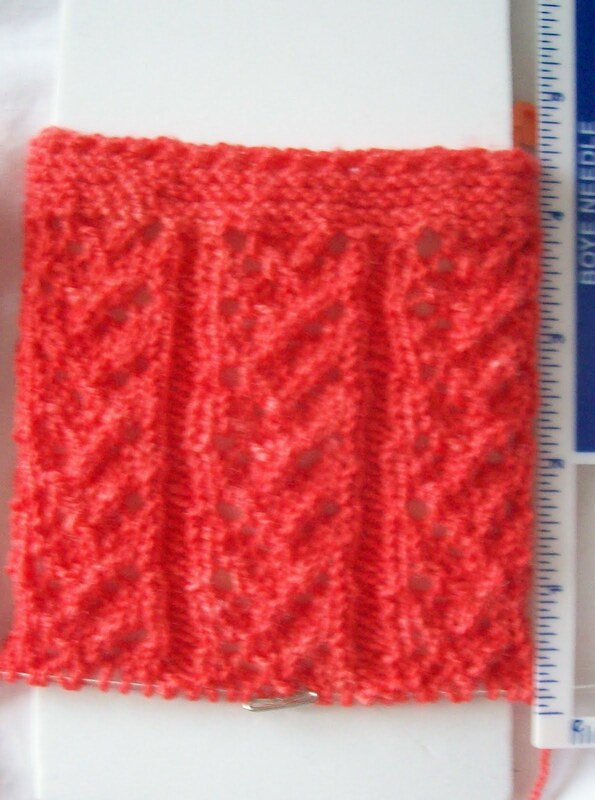 The pattern is a 16 X 16 matrix (16 stitches by 16 rows) plus a few more for an edging. (It's a knock off of the Japanese Vines pattern.) I found the stitch pattern in a book, and just reverse engineered it. My edging is a bit different, and I change a few stitches in the pattern, (so its not even the same as in the stitch pattern book,) but still almost the same. I've gotten 3 full repeats completed, (about 14 inches by 12 inches wide, when gently stretched; ½ of the first, (of 3) balls of yarn knit. I now know the pattern by heart—and well, once that happens: Boring! It's not boring me to tears (yet) I am hoping to keep loving it.. (and working at it) but other yarns keep calling to me! The sock have 4 ½ l repeats of their lace done.. (about 5 inches) but they're socks! I am almost done with the leg (and will be turning the heel soon) and then well they are done! Just when a stitch pattern begins to get boring with a pair of socks, you're done with the pattern (for a while) and get to turn the heel. 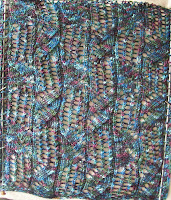 The foot is just half pattern work, and with a few more repeats, the end is in sight. Scarves.. (and I do like long scarves!) go on forever with no change. Still the pattern is a a very pretty one knit up. Behind the scenes, I am doing something I've talked about, but have procrastinated doing. Part one is going through my blog, finding all the free patterns I published here, fine tuning them, turning them all into PDF's, and adding them to my Ravelry Store. Part two is going through my files (some were zipped, and I needed to get an unzipper program to see them) and doing the same with a number of other patterns.. These are patterns I've written in the past few years, with no particular purpose. These, too, will become PDF's and go into my Ravelry store. Part four is editing and formating a third set of patterns—these I want to publish as a book—they are patterns with a unifying theme. I think success with parts one, two and three will be instrumental in making part four happen! All that is needed is for me to do it! I love that leafy vines scarf! Good luck with the rest of your project. I've found Ravelry to very helpful. Casey is a genius with code!